On October 8, 2007, my wife and I left Pearland in the Barracuda for a trip on historic old Route 66. We drove through western Arkansas, visiting family members along the way. We then drove across Missouri getting a preview of old Route 66 and then to South Elgin, Illinois, where we spent Saturday with her brother's family. Early Sunday morning we drove to Grant Park on the shore of Lake Michigan in Chicago and began our trip. We took ten days to drive to pier in Santa Monica, California, where Historic Route 66 now officially begins/ends. We took a short trip up the coastal highway north of Santa Monica and then returned home via Interstate 10. We got home on October 29th having traveled 5,870 miles as indicated by the odometer. We didn't have any serious problems. The rear main seal had started leaking and we lost about one quart of oil per 1000 miles. I had not re-tightened the exhaust manifold bolts after the initial installation and that plus the rough road allowed one side to start leaking. The major problem was that the right rear axle bearing, which I thought was going out before we left, did go out. I bought this car in early 1966. 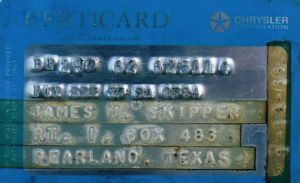 The certicard is dated 3-12-66. My wife and I were 25 years old and we had two little boys. 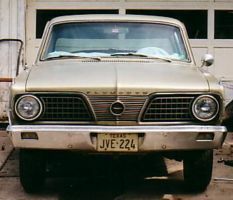 We had a 1960 Valiant V200, but we needed a second car. I bought it at a dealer in Alvin, Texas, that went out of business long ago. I checked some dealers in Houston also. Deals were running $100 to $150 over list price. Prices back then were about $1 per pound of automobile. I remember that the price was $2850 plus taxes and title paperwork charges. The options I got were V-8 engine with automatic transmission, factory air conditioning system, 14" steel wheels (they came with Plymouth wheel covers), and an imitation wood steering wheel. The color is "citron gold." I didn't get power steering and power brakes or the center console. The 1960 Valiant with 170 ci Slant-6 engine and 3-speed manual transmission actually seemed to be peppier than the Barracuda. I think that was because the Valiant was lighter and the Barracuda's automatic transmission may have been a little slushy. 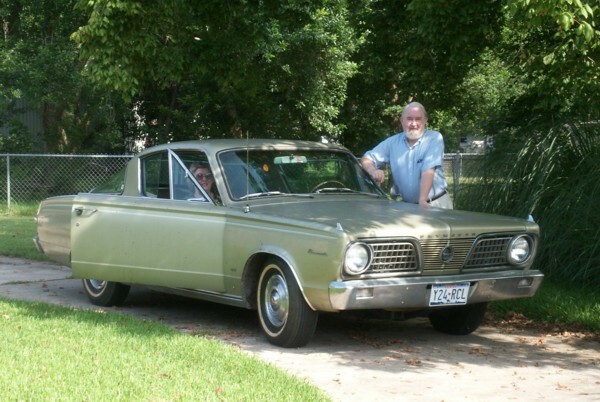 We drove the Barracuda 160,000 miles with very little maintenance. I remember replacing the starter and water pump. I put a field coil in the alternator. I replaced the lower ball joints and had brake work done over the years. The drums are still the originals. I change the transmission fluid and filter a few times. And of course plugs, points, and condensors and spark plug wires over the years. The radiator is the original. I think all the wheel bearings are original, but the u-joints have been changed. The u-joint at the transmission 'froze' up and caused some vibration. A mechanic replaced the transmission output shaft bushing and seal. I kept all that in a book which I could probably find. Don't know where the title is either. The driver's side is the 'bad' side of the car. My wife 'rear ended' a Dodge Dart and crumpled the left front fender and creased the left headlight beasel. There were also a couple of dents and scratches on the bumper. I pulled the fender off and took it to a fellow employee who did body work at home. I don't remember how much he helped but eventually I re-installed the fender and used a hydrualic jack to push the fender straight. The door was damaged while I was leaving the NASA site at noon and was making a left turn from the outside lane. The inside lane was marked "Left Turn Only," but the driver in that lane continued straight across the intersection and hit the driver-side door. The friend a work knocked the dent back out, filled in the rough spots with body filler, and primed it. It has remained that way for about 25 years. I plan to get the car painted after I get it back on the road. The minor dents near the top of the rear fender were caused by a metal storage building. A strong wind blew the little building from my neighbor's house across my driveway and it clipped the rear fender. On the right side of the Barracuda (in the photo above) is a 1986 Fifth Avenue. It is built on the upgraded Volare, Diplomat, LeBaron body. A 1973 Duster is behind these. The right rear corner of the 1980 LeBaron is visible on the right. This view of the engine compartment shows the 'short block.' Heads, manifolds, and accessories have been remove. 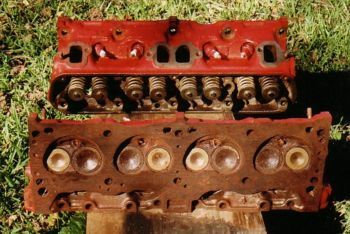 The 273 ci V-8 was built specifically to fit within the narrow A-body. 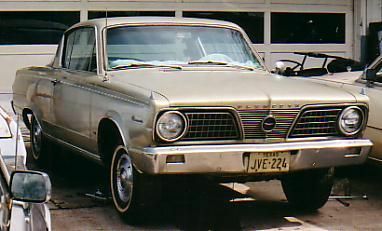 The A-body was originally designed for the Slant-6 (170 ci and 225 ci). The 273 V-8 had to have a special oil filter attachment to clear the body frame on the passenger side. The filter is just visible toward the back. It is hard to reach when the heads and manifolds are installed. There is a shallow notch on the driver's side of the block to add extra clearance at the steering sector. The exhaust manifod on that side was also a very odd design because of the interference with the steering column. 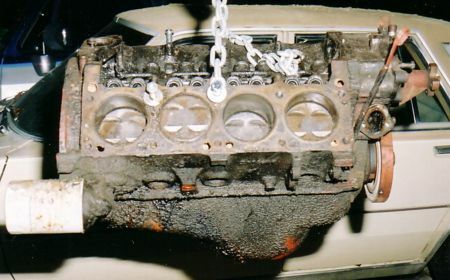 This is the short-block as it looked when it was pulled from the car. 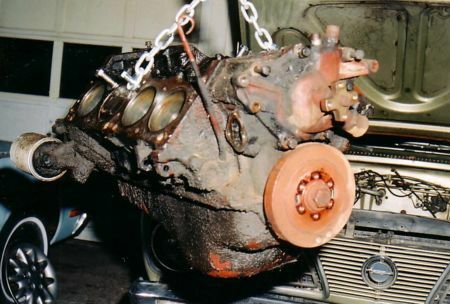 It is the small 273ci LA V-8 engine specifically designed for Chrysler's small 'A-body' automobiles. At that time the A-bodys were the Valiant, the Barracuda, and the Dart. The two inside exhaust valves (for cylinders 4 and 6) 'burned.' The actual cause of the problem was probably too much slack in the mechanical valve lifters. The 'keepers' had almost pulled off the ends of those two exhaust valves. With the keepers slipping that way, the valves weren't closing completely. 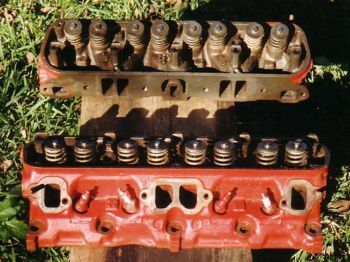 I pulled the heads and had them rebuilt by Houston Balancing and Engine Service. It cost about $300. They drilled out the heads and installed valve guides, installed new valves, and shimed the springs to bring them back to original tension. I wasn't sure whether they had installed hardened valve seats or not, but Cookie at the machine shop says they aren't. I stored the heads on newspaper in a bedroom closet and water from the adjacent bathroom soaked into the papers and rusted them to the gasket surface of the heads. It seems to scrap off pretty easily though. Cookie is going to check them out and install them on the rebuilt short block for me. He said he wanted to install the intake manifold and 'valve' covers, too. I occasionally oiled the cylinders and rotated the engine by hand over the years so it was pretty easy to break it loose when we started the removal process. That big nut on the crankshaft damper is 1 1/4" and I used a 1/2" drive break-over handle to get the crank to turn so we could unbolt the drive-plate from the torque converter. It was dark by the time we had the engine out so these engine photos were made with flash. That's a 1980 Chrysler LeBaron in the background. It has a 225ci Slant-6. The LeBarons were beefed up Volares, etc which were based on the A-body Valiants. They eventually became Gran Furys,Diplomats, Cordobas, and Fifth Avenues and continued until 1989. They even built an Imperial on the body. The Volares and subsequent version had 'L' shaped torsion bars running across the car in front of the engine. 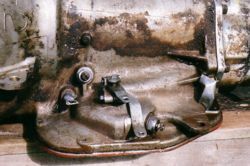 The beefier versions used big rubber cushions between the rear leaf springs and axle and over-size rubber bushings in the front mountings for the leaf springs. Cookie at COOKIE'S AUTO MACHINE SHOP rebuilt the engine. As of December 18, 2003, he had it almost done. He was installing the pistons and rods the day I visited. He said that he had found the last remaining cam shaft for a 273 ci with solid lifters. He said that he was told that only hydraulic lifter conversions are going to be made from then on. He agreed with me that the engine should be rebuilt as close to the original as possible. 2011 - Cookie finished the job and has now closed the machine shop and has moved somewhere up north of Houston. He wanted to do car restorations there, but I haven't heard anything more about that. I thought the engine, even at 160,000 miles was still in pretty good shape, but Cookie said that the cam is gone and the cylinders need to be bored out so new pistons will be required. He bought .040" oversize pistons. He bores the cylinders to size, then hones them to fit each piston, and finally works the cylinder surfaces with those 'Christmas Tree' type hones. He'll replace the cam sprocket and chain and the freeze plugs, of course. The oil pump/distributor drive shaft and bushing are OK. He thinks the water pump is OK. It is the second water pump and later model small blocks used different pumps. This one has the water inlet on the driver's side. The later ones were switched to the passenger side. That makes the radiator's different, too. I think my original radiator is OK.
On most of the 'small block' Chrysler engines, the oil filter was attached directly to the side of the engine block. The right-angle attachment for the oil filter is visible here. But there wasn't room for a full-size filter in the A-body so a right-angle adapter was made. This attachment allowed just enough clearance between the filter and the uni-body frame. The new short oil filters would probably have fit OK. I think I'll use the short ones now just because they'll be a little easier to put down into that tight space. I used a pressure washer to clean most of the compartment (the painted surfaces). I scrapped the oily dirt from the 'K'-frame and then used engine cleaner. The heads were rebuilt by Houston Balancing and Engine service about 20 years ago. I painted them �Ford� red which was the closest available to the original. Chrysler later switched to �Chrysler green� which was an odd bluish green. I never reinstalled the heads. The heads were stored on pads of newspapers and the paper got wet. It looks like they can be cleaned up. I don�t remember whether or not �hardened� valve seats were pressed in. 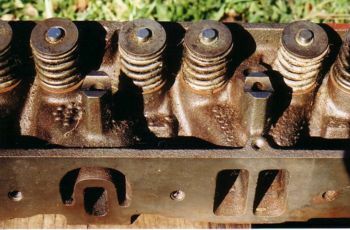 Hardened valve seats are necessary for use of unleaded gas. Brass shims were added to tighten the valve springs and the heads were drilled out and brass valve guides were pressed in. When I pulled the heads, I took all the miscellaneous parts and stored them in various locations in the garage. Unfortunately, there was something in the box that I used to store the carburetor, distributor, coil, and some other parts that 'ate up' the bottom and side of the carburetor. 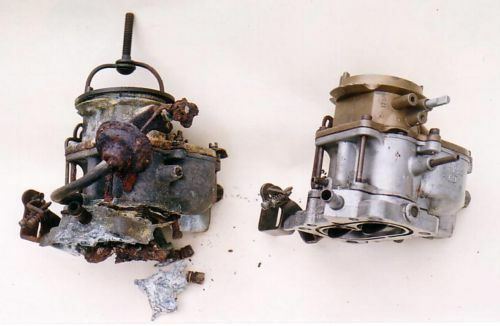 The original is on the left in the photo and a NOS carburetor that someone gave me many years ago is on the right. New carburetors don't come with all the little pieces, but some from the old carb are usable. I still need a choke lever and the choke pull-off link. The vacuum pull-off unit, itself, used to be available from car parts stores, but I'm going to have to search for one of those, too. The transmission was still working well at 160,000 miles. The only work had been fluid and filter changes. I'm having someone disassemble it and install a gasket and seal kit and any other parts that need to be replaced. The red 'C'-clamp keeps the torque converter from slipping out. 'Rocky' rebuilt the transmission for $400. I took it to him in the middle of the week and it was ready in two weekends. It looks great from the outside. The area inside the bell-housing and around the pump look good. That's about all I can tell from looking at the outside. This photo shows the shift arm and the throttle control. The oil line fittings are covered with duct tape. I have read that 1966 was the first year that Chrysler used a rod and lever shifting system for its automatics. 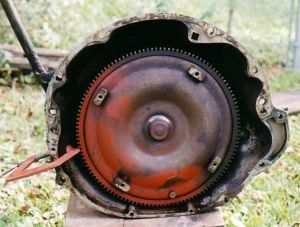 From 1955 through 1965, a cable was used to set the gear position. The transmission end of the cable entered the housing just ahead of the levers you see in this photo and apparently connected to a lever inside the transmission. The transmission shift cable didn't have a park position. I think a 'park' lever (with a cable to the parking sprag?) was used some years and some years the parking brake was the only thing available. From 1956 through 1964, Chrysler used a push-button mechanism to push and pull the cable to select the gears. The push-button system was very ingenious, but hard to describe in words so I'm not going to try. In 1955, the cable was pushed and pulled by a shift lever on the dash on the right side of the steering wheel. In 1965, the cable was actuated by a standard column shift lever. Cars with console shifters had variations that connected there. This is the passenger side of the transmission. The band actuating pistons are in cylinders in the humps on the lower side of the housing. I once measured the actuating pressures by connecting copper lines, with pressure gauges attached , to the pressure taps on the side of the transmission. I jacked up the back wheels and ran the car through it gears to check shift points and pressures versus speed. 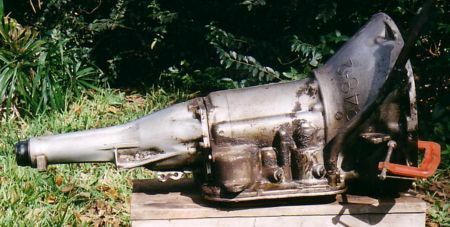 The number 948-2 is cast into the top of both sides of the bell housing. I didn't even take the simplest precautions with the gas tank when I stored the car. 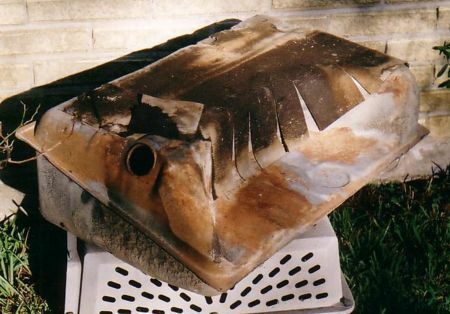 After 20 years of sitting with two or three gallons of gas in it, the inside of the tank was covered with gum, varnish, and rust flakes. I used a pressure washer and detergent and got much of it out, but it needs more work. The gas intake line/sender unit were covered with varnish and rust. The inlet line filter tore up as I removed it. The inlet of the line was filled with gum, but it came out with a pipe cleaner and water will easily flow through it. The tarpaper pad on the top of the tank is in pretty good shape. One flap tore off from all the moving around. The rust on the outside is just on the surface and doesn't seem to be a problem. I'm going to use the original just to be able to say I could. If necessary, the tank, sender, and pad can be replaced for about $350. 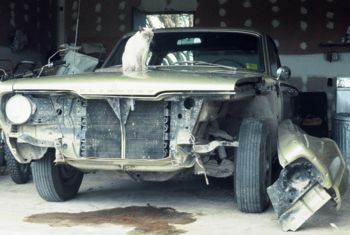 Do you have any early Mopar repair questions? E-mail me at jamesmskipper1141@att.net. 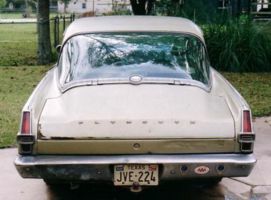 I maintained this Barracuda for 17 years and before that a 1960 Valiant V-200 with a 170 ci Slant-6. Later I bought, and still have, a 1970 Plymouth Fury Sport Suburban station wagon with a 440 ci engine with stock Holley 4-barrel carburetor. I bought Dusters and Valiants for my children and also owned 1980 and 1981 LeBarons, a 1980 Chrysler 5th Avenue, and a 1986 5th Avenue. 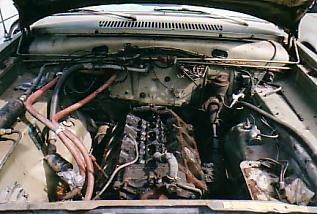 The 1980 and later vehicles had 318 ci engines with various 2-barrel carburetors. 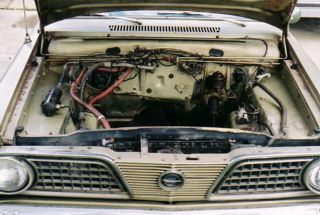 I've rebuilt starters, carburetors, and alternators; repaired brakes; replaced ball joints, wheel bearings, U-joints, and water pumps; and electrical and ignition work. I have the original Chrysler shop manuals for the 1960 Valiant and for the 1966 Plymouths. I may be able to answer your question.